This is me. My name is Jasmine, I’m 21 and I’m from Portsmouth, England. I was diagnosed with Freidriech’s Ataxia, a degenerative neurological disorder, in October 2000. As a side effect of this condition (which has meant that I can’t walk at all), I also have metal rods fused to my spine to correct scoliosis. My wheelchair is Quickie Helium and has a rigid frame, though the wheels do come off and the back folds down flat to the seat. Despite the obvious difficulty, I’ve always loved travelling, and I have just returned from the trip of a lifetime – three weeks exploring the North Island of New Zealand (November 16th – December 9th 2013). As a massive Tolkien fan, and an environmental scientist, this trip was a dream come true. We (myself, my friend Julia and my carer Steph) flew out of Heathrow on Air NZ flight NZ001. This was a direct flight to Auckland; with only a two-hour break at LAX. We only chose this flight because I was told that the plane (A Boeing 777-300) had a disabled toilet on board. It wasn’t a very good one. It was bigger than normal airplane toilets; there was room to get the aisle chair adjacent to the toilet but not much else. The handrails were too small and not really in the right place (the steward had to lift me on to the toilet because I couldn’t reach). And of course, they were only on one side. It’s law in the UK that there have to be handrails on both sides, but I don’t think its law anywhere else. Also, the aisles on this plane are ridiculously narrow. The aisle chair on its own is horrible (it’s ridiculously narrow, and I felt very unsteady the whole time I was sat in it), but when combined with the narrowness of the aisles – my knees hit every chair and my shoulders and hips scraped along every chair too – moving around the plane was terrible. Apart from the toilet and the aisles, Air NZ were brilliant – they upgraded us to Skycouch (its like Economy +), and they were very helpful and friendly. I’d rented a van from Freedom Mobility before we left England (a Toyota Noah), and they met us at the airport. They showed us how to use the car (it had an electronic swivel chair), told us about NZ road law and gave us a SatNav (this was invaluable). The car was great, and the boot was big enough to ft everything comfortably (three big suitcases, my wheelchair and our rented equipment). I’d already bought a New Zealand disabled badge for our stay ($35 from CCS mobility). Then we set off. Our first stop was Invacare, who I’d rented a shower chair and toilet frame from. The frame was fine, but the back of the shower chair had the annoying habit of tipping forward when you put any weight on the arms – which was not helpful at all! We didn’t do much of anything on the first day (we were very jetlagged), once we’d picked everything up, we checked straight into our motel, The Best Western Auckland, and went to sleep. The room was lovely, and quite quiet (we were on the end of the terrace). The bathroom was a wet room (but it dried quite slowly as there was only one small window), and the sink could fit a wheelchair underneath. The room only had a microwave and a kettle. On the second day, we went Whale and Dolphin watching from Auckland with the Auckland Whale and Dolphin Safari from Explore NZ. 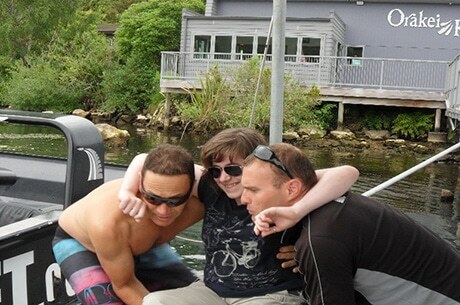 They helped me get down to the wharf (down a very steep ramp backwards) and they lifted me onto the back of the boat. It was probably the best spot – any waves didn’t hit us and dolphins like swimming in the wake of the boat. So we saw loads of dolphins and even a Bryde’s Whale. The rest of the boat, however, wasn’t accessible including the toilet. Next we went to Kelly Tarlton’s SEA LIFE Aquarium. It was completely accessible, even the shark tunnel (the path and conveyor were quite narrow, but my wheelchair is 22 inches wide wheel to wheel and I fit on both). The extra tours (swimming with sharks and walking with penguins) are understandably not accessible, but the majority of the Behind-the-Scenes tour is – the only bit that isn’t is going to feed the fish, but they let us feed one of their ‘hospitalised’ turtles instead! On our last day in Auckland we went up the SkyTower, which is also entirely accessible. I’m not too keen on heights, so we didn’t stay long. After that, we drove to Parnell Road and went shopping. It’s quite a steep road, and some of the shops are a bit tight to get in and around. The next day we spent driving down to Hamilton (about an hour) and then relaxing. We stayed at the Albert Court Motor Lodge for three nights, and it was beautiful. The hosts were lovely, and very helpful. The room was spacious, and the kitchen was all down at wheelchair height, so I could reach to cook (there was a hob, microwave and a kettle). The bathroom was a wetroom again, but the sink was very low – I certainly couldn’t fit underneath and I doubt if anyone could have. From Hamilton we first went down to Waitomo, and to the Ruakuri cave. This is the only wheelchair accessible cave in the Southern Hemisphere (as such its always quite busy – so we had to ring them before to book), and though some of the paths are quite steep (combined with semi-darkness), I managed to get everywhere the able bodied people could. 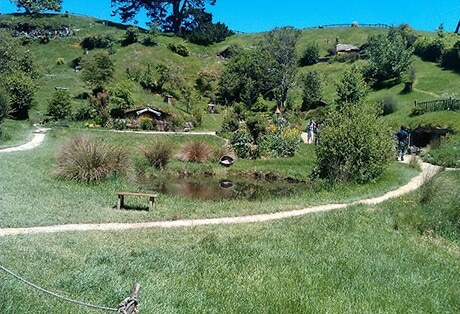 The next day was the day that I had been waiting for ever since I decided to go to New Zealand – we went to Hobbiton. The car park and the path to the ticket office are gravelly and a bit uneven, but then it is still a working farm (there is a ticket discount for wheelchair users). We had to follow the tour bus in our van up to the set, as there are a few steps to get on. Once you get to the site, the paths are quite steep and narrow (see the photo on the left). I got around perfectly fine, with help on the steeper bits, though I physically couldn’t get up to Bag End – the hill was very steep and I wasn’t brave enough to attempt it. There is a cobbled bridge, and the paths are a little bit uneven in places, but that’s to be expected – its meant to look and feel rural. We drove down to Taupo after Hamilton and stayed at the Karaka Tree Motel for four nights. The room was a bit tight in some areas, and the bathroom wasn’t very good. The bathroom was split into two rooms – a large sink in one, and the toilet and shower in the other. This meant the toilet room was quite tight – there was only just room for me to put my wheelchair adjacent to the toilet. The handrails were also initially in the wrong place, but one of the hosts was kind enough to buy and drill a new handrail in the right place. The shower room was also too small for a shower. The carpet was also thick enough that it made pushing on it quite hard. I don’t think I would recommend this motel for a stay of more than one night. After our first night in Taupo, we drove to Rotarua and visited Te Puia, which is a geothermal valley and a centre of Maori arts and crafts. There’s also a kiwi house here, with two of New Zealand’s national birds. Nearly all of the geothermal park is accessible (though one or two of the paths are a bit steep), and even the bits that aren’t, it’s still possible to see. We also did the Maori cultural performance. The room is accessible by a ramp and chairs were very quickly moved so that I could sit at the front. I’ll just say now, the haka is much more intimidating in person than on the TV! We also went to the carving school. There are steps and a bridge to see them carve, but as I couldn’t get up they let me come into the workshop through a side door. They were so kind and they even showed us a piece that was being sent to the UN! We went on the Riverjet up the Waikato River on the next day. I emailed them before, and I was told that we could do the Scenic Safari Tour (all of the others involved walking at some point). Two men carried my chair and I down to the boat, and then lifted me onto the boat (see the photo on the right). We were on the big boat, called the ‘Beast’, so my wheelchair could fit in the space next to the engine. I could then slide along the seats. They helped me back into my chair at the café (there was a geothermal park on the opposite bank, but it was not accessible) and did the same on the way back. Our last day in Taupo was spent just wandering around the town and the lake. The paths through the town were generally good, but some of the crossings have quite substantial kerbs. On the next day we drove down to Taihape, which is a very rural farming village. The drive was a rather long one, but stunning at the same time. The Black Gates of Mordor were filmed around the Desert Road (State Highway 1), and it’s very easy to imagine being on the Plains of Rohan or parts of Gondor here. On this day I’d planned a helicopter flight around the three mountains along the way (Ruapehu, Tongariro and Ngauruhoe) with Heliview, who were very willing to accommodate a wheelchair user (they were willing to help carry/ lift me onto the helicopter, and even willing to remove the front seats so that I had more room), but the weather was too wet and windy for a flight. 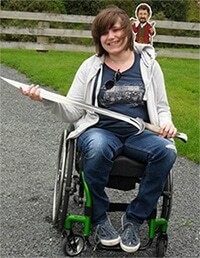 Instead we went to the NZ army museum, which was accessible. In Ohakune we also drove up to ‘Gollum’s Pool’. We drove up the mountain, but as it was still wet I didn’t go up to the pool – the path was a dirt track and it was a bit uneven. My friend Julia did go, and she said it might be doable if I’d been brave enough. I wasn’t. We also stopped briefly at the Powderhorn Chateau, who hosted most of the LotR cast during filming (the visitor’s book is full of comments from them). There’s also a restaurant here, which serves some of the best pizza I’ve ever had. We stayed for one night at the Aspen Court Motel, and it was great. The room was massive and quite luxurious (the bed was the comfiest bed I slept in when in New Zealand), and the bathroom (wetroom) was definitely big enough to have a shower. I could just about get under the sink, but I don’t think any bigger wheelchairs could. After this we drove the three hours down to Wellington, where we stayed at the Best Western Wellington for six nights. The room itself was beautiful, and it was the only motel we stayed in that had an oven (as well as a hob, kettle and microwave). The double bed however was exceptionally narrow, and while the bathroom (wetroom) was quite large, there wasn’t a window and I think the extractor fan was broken. The bathroom then dried very slowly. The shower was plenty big enough, and there was just enough room for me to fit under the sink. On our first day in Wellington, we visited the Te Papa national museum. It’s a modern building, so is nearly entirely accessible. The only exceptions are some parts of the exhibits, like the earthquake simulator. 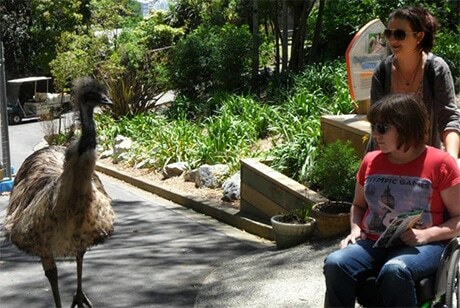 The next day we visited Wellington Zoo. Some of the exhibits and animals here are amazing (like Sumatran tigers, Cotton Top Tamarins and Malayan Sun Bears), but the entire compound is ridiculously hilly (see the picture for an example), to the extent that it was occasionally dangerous. We did however; manage to get around the whole zoo (rather cautiously), though only because my pusher (Julia) was very strong. I emailed the zoo before I went and they mentioned that some of the paths were quite steep and that some of the exhibits probably weren’t accessible. They also mentioned that they are trying to improve accessibility. Our third day in Wellington we visited the Weta Cave, the Weta mini-museum and shop. Parking was a bit awkward (it’s free on-street parking, but its not exactly flat), and the there’s a curb to get up, but it’s worth it. The best thing here, apart from all of the beautiful merchandise, is the Window into Workshop tour. The tour is entirely accessible, and the tour guide was very careful to ensure that I could see everything. We also then visited the famous Chocolate Fish Café (technically its called Scorch-A-Rama), which is also entirely accessible. We went into Wellington City Centre on our fourth day. We parked in a multi storey car park, but we couldn’t find a disabled space anywhere. My wheelchair just fit in the gap between our van and the next car, and transferring was quite tight. However, after this the city centre was nearly entirely accessible, and though some streets (Cuba Street especially) were slightly steep, there weren’t too many big curbs and steps. We also went into Fidel’s café (a favourite of Billy Boyd and Dominic Monaghan), and while it is tight and very busy, the front of the café is accessible (if you can get over the 1 or 2 steps at the door). Our last day in Wellington was spent wandering around Johnsonville, which is the suburb where our motel was. It was largely accessible, though a few of the paths were quite steep and a few pavements were a bit uneven. We had initially planned to visit Kaitoke National Park, which is where Rivendell was filmed, but the weather turned too wet and windy to risk the paths. I was advised that some of the paths were quite steep, but accessible. Our last stop before we flew home (from Auckland airport) was in New Plymouth. The drive from Wellington was horrendous – about five hours – but it was worth it when got to our motel. We stayed at the Landmark Manor Motel, which was beautiful. The hosts were also lovely – The room was big enough to get around comfortably, as was the bathroom. The shower was definitely big enough for a shower, and the sink was high enough for me to get under. Our one day in New Plymouth was spent wandering along the Coastal Walkway, which was largely accessible though very steep in some places. The pathway did however, cross over train tracks at multiple points. The crossings were fairly easy though, as long as you don’t get stuck in the gaps between tracks. We stopped at a café called the Bach (pronounced batch) on the Breakwater, which was styled very rustically but also completely accessible. Our flight home wasn’t until quarter to eleven at night, and the drive from New Plymouth to Auckland only takes three to four hours, so we had to find something to do. While researching the drive to Auckland I stumbled across the Hairy Feet Scenic Film Location Tour in Piopio – which is where they filmed the Trollshaws, the first warg attack, Bilbo receiving Sting and Radagast’s ‘run’. As this tour is on a working farm, I automatically assumed that it wouldn’t be accessible. We rang them anyway, as we were desperate for something to do, and I’m so glad we did. Suzie, one of the tour guides, told us that the tour might be achievable. She explained that all of the pathways were gravel, and that there are a few hills and steps, but that she and Warrick (the other guide) were willing to help me to get around. The tour itself was amazing, and the scenery was breathtaking, and Suzie and Warrick were so kind, knowledgeable and helpful (they pushed up hills and through tight paths, and even carried me down stairs (see the picture on the right)). This was, quite possibly, my favourite trip of the entire holiday. This was the end of my trip around New Zealand, and I can honestly say, despite various difficulties and dramas, I thoroughly enjoyed it. My only wish is that New Zealand was closer! If you have any questions about this report or my trip, please don’t hesitate to contact me on jazzy.blue@hotmail.co.uk.